What’s Happening with Irish Seed Savers? 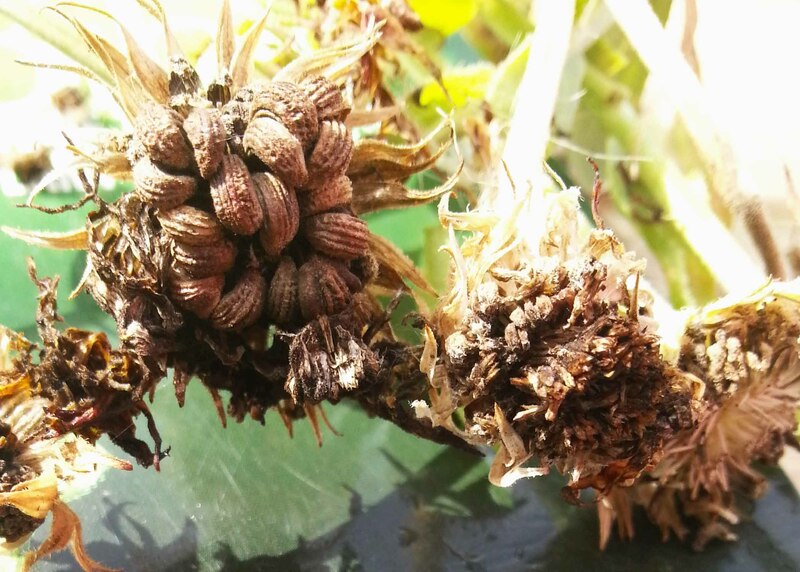 On Saturday, 16th February 2019 from 10am to 3.30pm Wayne Frankham from Irish Seed Savers will be coming to Carlow town to run a workshop about saving our seeds and protecting our heritage. 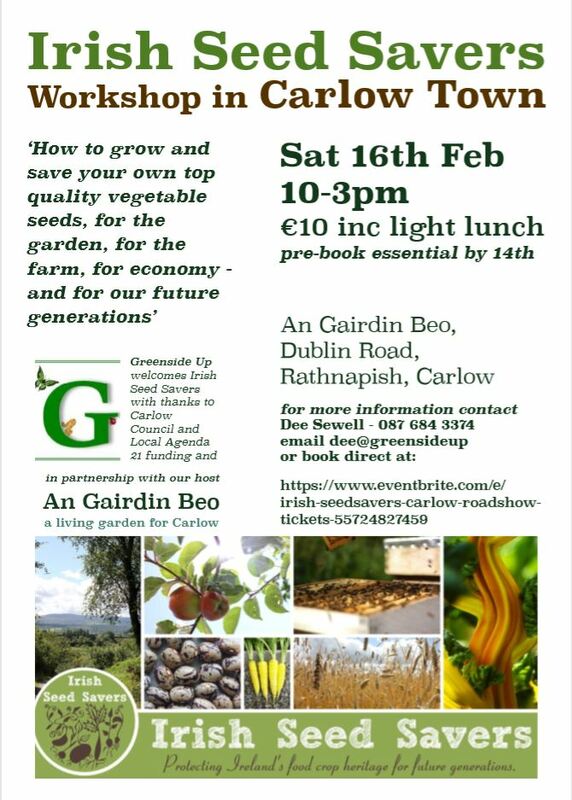 It will take place in An Gairdín Beo, a charitable project and community garden in the heart of Carlow town who are partnering the event. The cost for anyone participating is €10.00 each for the day. This includes refreshments, a light lunch of soup and sandwiches (vegetarian friendly) prepared by local social enterprise The Delta Centre, and the booking fee which Greenside Up has managed to absorb into the costs thanks to Carlow County Council/Local Agenda 21 funding, making this a not-for-profit event. The workshop will include seed background including cultivation, culture & challenges, local & international solutions, basic botanics including classification, producing quality seed, bolting/overwintering, isolation, populations, manual handling, storage. 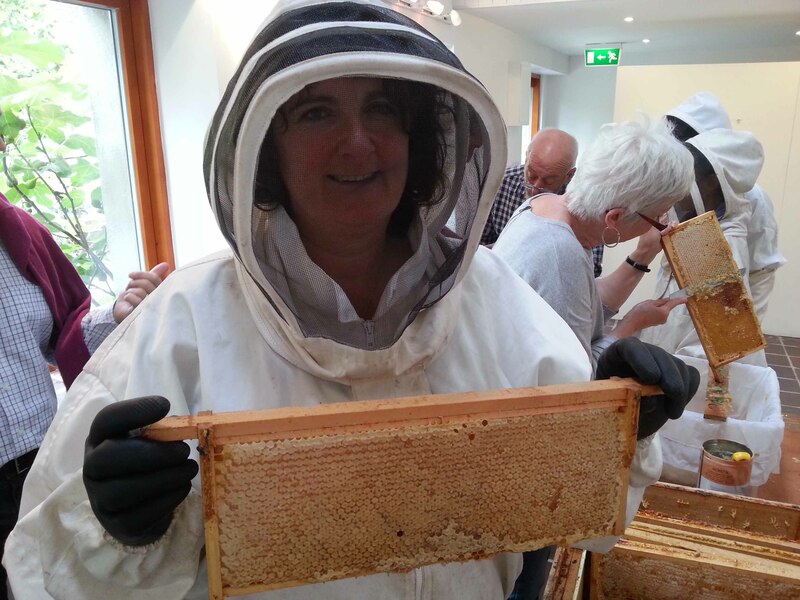 Why is this event with Irish Seed Savers important? Irish Seed Savers co-ordinate the Seed Sovereignty Programme in Ireland. It’s a programme which aims to aid and promote the development of agro-ecological seed production in Ireland and the UK. Set up by The Gaia Foundation in the UK, it works with new and established seed producers to increase consumer and producer awareness, and increase production opportunities for seed produced in the UK and Ireland. Current figures suggest over 80% of seed is imported. Certified organic seed figures are even higher. Yet a handful of small enterprises including Real Seeds, The Seed Coop and Vital Seeds in the UK, as well as Brown Envelope Seeds, The Herb Garden and Irish Seed Savers here in Ireland, all demonstrate the diverse range of seeds which we can produce in our own environment. And they are all active in sharing their skills and encouraging more growers to produce great quality seed in our own farms and gardens. The programme has enabled training programmes for those wishing to diversify their commercial production to incorporate seed for own use, exchange and market. It’s a development which many growers find immensely rewarding as they engage in the full cycle of plant life. It’s not without its challenges, contending with pests, humidity and seasonal quirks and variables in weather. But with each plant generation, adaptation to regional environments occurs in each crop variety, and experience develops to share between growers. This is a pattern which is emerging around the world. The Gaia Foundation took great inspiration from the Bauta Family Initiative on Canadian Seed Security who generously share their experiences online and visited the UK in 2014. Here in Ireland Wayne Frankham is Seed Outreach coordinator at Irish Seed Savers. They have a dedicated network of Seed Guardians who help to expand the production capacity of the Seed Savers 20 acre farm in Clare. The Guardians have all undertaken four season Seed Saver training, with the most recent trainees beginning last November. Wayne has been visiting established Guardians, taking part in public grower and culinary events, and providing basic seed training for growers and communities, all around Ireland and the UK. Why join the workshop on the 16th February? This is a great opportunity to learn more about the trials and events touched by the Programme, as well as learning the essentials of seed saving for this and future generations. Because, as the Seed Sovereignty website says ‘a food revolution starts with seed’. For more information about seed sovereignty and seed security look up Irish Seed Savers and see the links below, or come along to the workshop and find out more.